One of the most, if not the most anticipated colorway of the Nike Hyperdunk 2010 is now available for purchase from Nike. Making use of one of the most well known color schemes from Nike, its no surprise the amount of buzz there is around this latest release of the Hyperdunk 2010. Although the Hyperdunk 2010 is currently one of the best performing basketball shoes on the market, don't be surprised if you see this latest colorway being sported off the court more than on the court. Matte grey covers the lightweight synthetic upper, along with metallic silver taking place on the Swoosh. Black arrives on the collar lining, heel counter and continues along the midsole with the help of some volt speckle. Black and volt come together once again on the laces, while volt continues to be seen on the outsole and branding throughout. 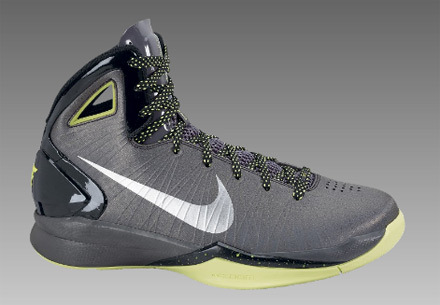 This all new colorway of the Nike Hyperdunk 2010 is now available for purchase from NikeStore.